With ThermoCare Cold, you can send medicines maintained at an ambient temperature range of between 2°C and 8°C. The ThemoCare Box is GDP certified and is transported in the mass market parcel and express channel, reaching recipients throughout Switzerland on the following day, usually by 10 a.m., or by no later than 9 a.m. as an express item. Request the required number of ThermoCare Boxes using the «Order Dispoboxes» online service. Orders received by 11 a.m. are delivered to your chosen location the next day. .
You send us the shipment data electronically, e.g. via DataTransfer, WebService Barcode or the «Domestic parcel labels» online service. We collect the filled boxes from you, or you can deliver them yourself to one of logistics centers. If required, the consignment can be secured using seals. The consignments are transported using Swiss Post’s standard parcel service. The ThermoCare Cold shipping solution allows you to transport your medicines to your recipients in a GDP compliant manner. The ThermoCare Box is a passive temperature-controlled solution. It has been fully certified and facilitates GDP compliant transportation of medicines. A billing relationship with Swiss Post and a valid franking licence for parcel post and express delivery. 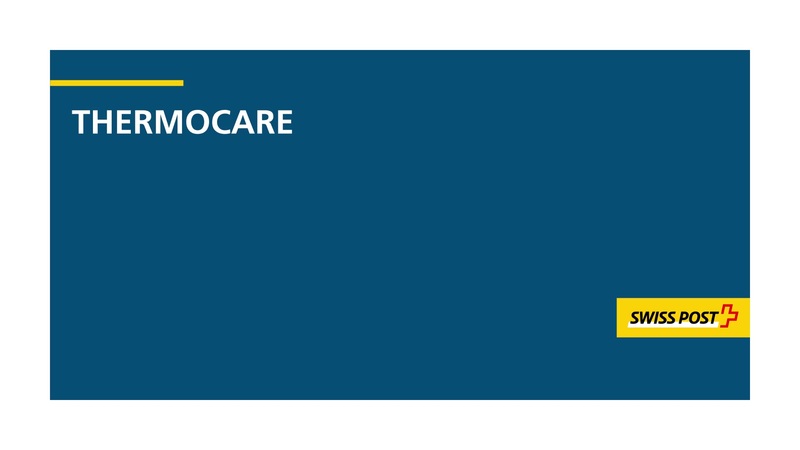 For the “ThermoCare Cold” value-added service, a charge of CHF 25.00 excluding VAT is applied. For an annual volume of 1,000 consignments or more we offer reduced contract prices that are categorized according to volume. Your customer advisor will be happy to make you an individual offer. The ThermoCare Cold passive temperature-controlled shipping solution allows you to transport your medicines to your recipients in a GDP compliant manner.